﻿﻿﻿﻿﻿﻿﻿﻿According to the latest UN high commissioner for refugees (UNHCR) report the global refugee figure passes 50 Million for the first time since the second world war More than half of those displaced are children, and aid organizations are reaching a breaking point. The annual UNHCR global trends report said - Half the world's refugees are children, many travelling alone or in groups in a desperate quest for sanctuary, and often falling into the clutches of people traffickers. More than 25,000 unaccompanied children lodged asylum applications in 77 countries last year, a fraction of the number of displaced minors across the globe. We are witnessing a quantum leap in forced displacement in the world," António Guterres, head of the UN's refugee agency, said as figures for 2013 showed a total of 51.2 million refugees, asylum seekers and internally displaced people. If displaced people had their own country it would be the 24th most populous in the world. The increase of 6 million over the 2012 figures has mainly been driven by the war in Syria. By the end of last year, 2.5 million Syrians had fled across the country's borders and 6.5 million were internally displaced – more than 40% of the population. Conflicts in the Central African Republic and South Sudan also contributed to rising numbers. • Refugees – 16.7 million people worldwide. Apart from 5 million Palestinians, the biggest refugee populations by source country are Afghans, Syrians and Somalis, which together account for half the total. The main host countries were Pakistan, Iran, Lebanon, Jordan and Turkey. Eighty-six per cent of the world's refugees are hosted by developing countries – up from 70% a decade ago. • Asylum seekers – close to 1.2 million people submitted asylum claims, mostly in developed countries. 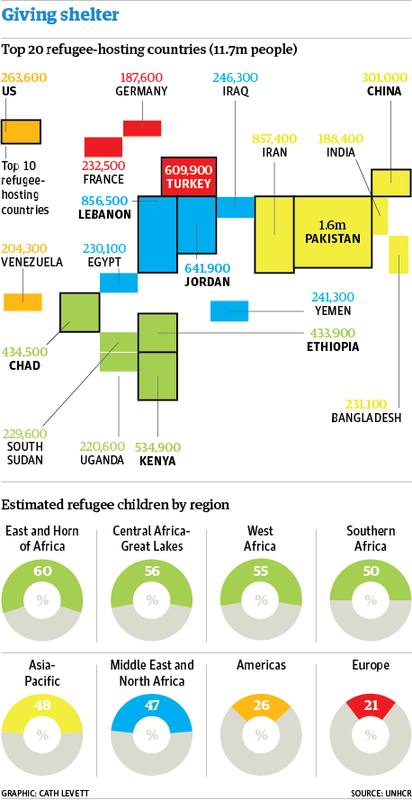 In terms of country of origin, the highest number was from Syria (64,300), followed by the Democratic Republic of Congo (60,400) and Burma (57,400). Germany was the largest recipient. • Internally displaced people – a record 33.3 million were forced to flee their homes but remained within their country's borders. Many of those crossing borders fell into the hands of increasingly sophisticated people-trafficking gangs. "We see these networks of trafficking and smuggling becoming more and more international, multinational, and linked to other forms of international criminality", such as guns and drugs. Besides war other factors that forced people to leave their homes included climate change, population growth, urbanisation, food insecurity and water scarcity – many of which interacted with and enhanced each other. Humanitarian organisations could only mitigate the impact of conflict on ordinary people. Guterres says "There is no humanitarian solution … The solution is political and the solution is to solve the conflicts that generate these dramatic levels of displacement."